Acceptance and Commitment Therapy (ACT for short) is one of the newer evidence based psychological therapies that does not subscribe to “the power of positive thinking”. 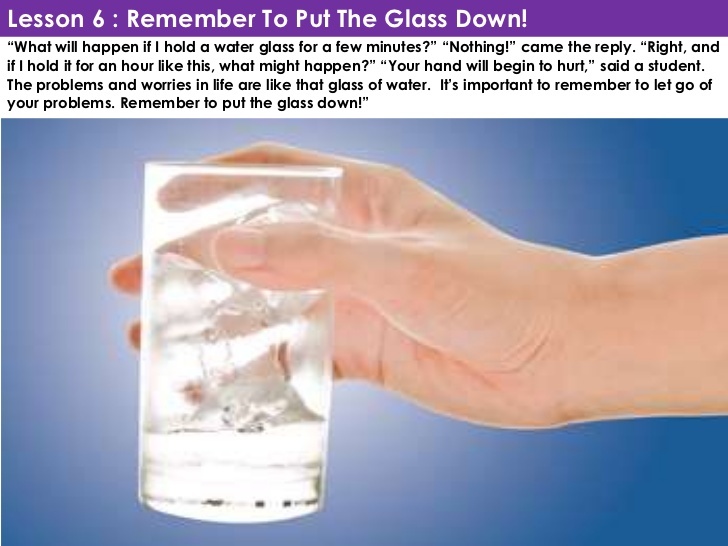 Instead of wresting with our own suffering and trying to convince ourselves that “the glass is half full”, ACT says “put down the glass”. In Acceptance and Commitment Therapy the emphasis is on accepting what is out of your personal control, while committing to action that will improve your quality of life. Happiness for a dog or a cat is straightforward. If pets are given shelter, food and drink, warmth, stimulation, play, and physical health they are contented. Without the intervention of humans, animals are often missing some of these basic things. They live, as we say, a dog’s life. Many humans also are missing such basic items too, and it is not difficult to understand the misery of a person living without them. But many humans have all the things a nonverbal organism would need to be happy, and yet they are not. Humans can be warm, well fed, dry, physically well, and still be miserable. Indeed, humans can have forms of excitement and entertainment unknown in the nonhuman world—flat screen TVs, exotic cars, and airplane trips to the Bali—and still be miserable. Literally nothing external that you can name—great looks, loving parents, terrific children, a caring spouse—are enough to ensure that a human will not suffer terribly. Every day a human being with every imaginable advantage attempts suicide. Every morning a successful business person gets to the office, closes the door, and reaches quietly into the bottom drawer of the desk to find the bottle of gin hidden there. Dr Ben Buchanan uses Acceptance and Commitment Therapy in his practice to help people who don’t just want to feel good, but want to find meaning, purpose and acceptance in their life.